As the fourth crowned monarch of the Tudor dynasty , Mary is remembered for her restoration of Roman Catholicism after the short-lived Protestant reign of her half-brother. During her five-year reign, she had over 280 religious dissenters burned at the stake Death_by_burning in the Marian persecutions List_of_Protestant_martyrs_of_the_English_Reformation. 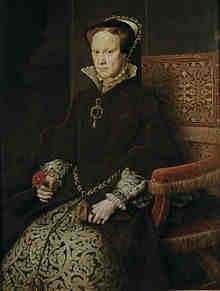 Her re-establishment of Roman Catholicism was reversed after her death in 1558 by her younger half-sister and successor, Elizabeth I of_England.